The 1913 waterside workers’ strike affected ports throughout New Zealand. Special constables – often farmers – were recruited by the government to load and unload ships and control strikers. About 700 special constables occupied Lyttelton. 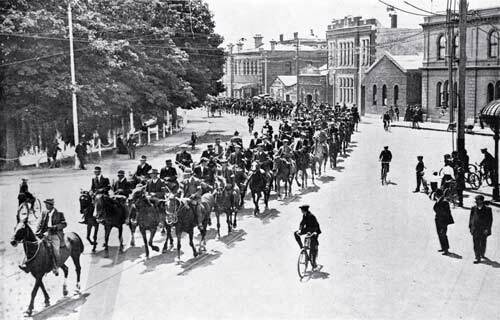 This procession of mounted constables through central Christchurch was possibly intended to warn strikers and their sympathisers of the government’s resolve.